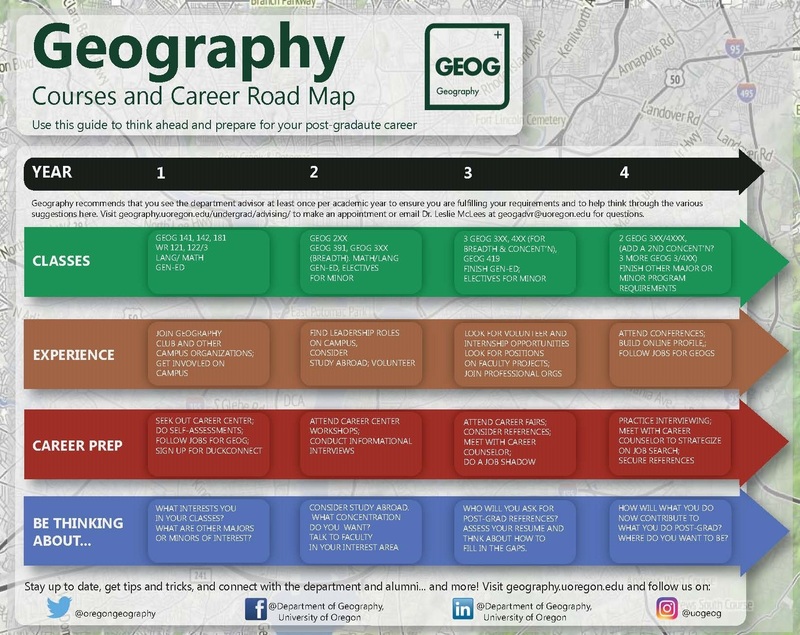 The Geography major requires a minimum of 46 credits in Geography (or specifically noted Environmental Studies or Asian Studies) courses. At least 9 Geography courses must be taken for a letter grade. A grade of C- or better is required for any course applied towards the major, and a GPA of 2.25 or better is required in courses used for the major. A major check sheet (affectionately known as the ‘Green Sheet’) summarizes the requirements below. See our Preliminary Course Offerings for the 2019-2020 academic year. For advising, you can make an appointment with Dr. Leslie McLees through the online scheduler. You can also contact her at geogadvr@uoregon.edu for a response generally within one business day or to make an appointment if drop-in hours or hours on the scheduler are not available for you. Drop-in advising for Winter 2019 is Thursdays from 2:00-3:30. All Geography majors seeking a B.S. degree will be required to complete any math sequence that satisfies the University’s math requirement for a B.S. degree. Math classes must be passed with a grade of at least C- or P.
For the Geographic Information Science Track, we recommend a computer programming sequence. for climatology, we recommend a calculus or computer programming emphasis. All Geography majors seeking a B.A. degree must demonstrate proficiency in a second language either by passing the third quarter of a second-year university language course with a grade of C- or better or by an examination indicating an equivalent level of proficiency. If you are considering applying to graduate school in the future, we strongly recommended that you complete both the math and language requirements. All undergraduates must satisfy group requirements. For details see Group Requirements in the Bachelors Requirements section of the UO Catalog. Geography majors should consult their advisor to determine which group-satisfying courses best support their major. 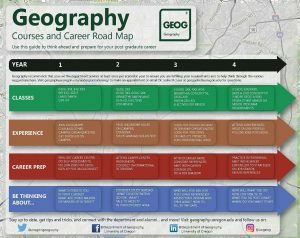 Please note that for students who have Geography is their first major can only use ONE course with the GEOG subject code to satisfy the Group Requirements. At least 9 Geography courses must be taken for a letter grade. A grade of C- or better is required for any course applied towards the major, and a GPA of 2.25 or better is required in courses used for the major. Everyone needs the fundamentals. These introductory and advanced (both required) courses will stretch your horizon, sharpen your critical thinking skills, synthesize core principles, ignite a passion for learning, and might even surprise you. Let the discoveries begin. To ADD the Geography major or change your concentration, fill out the form on this page. To DROP the Geography major, fill out the form on this page. New majors are strongly encouraged to make an appointment with the Geography advisor, Dr. Leslie McLees, through this online scheduler or through email at geogadvr@uoregon.edu.